While there are many different ways to add text to photos, few are as versatile as Movavi Photo Editor. Essentially it will let you add text to photo while at the same time providing you with a wide range of options so that you can fully control its appearance. On top of that it is really easy to learn how to pull it off, and so you should be able to get it done in minutes. If you have a photo that you want to add text to, launch Movavi Photo Editor. Once you do, click on the ‘Browse for Images’ button right in the centre of the working area and select the photo that you want to add. You’ll notice that you can drag and drop the file into that area as well, for ease. All the tools you’ll need to add and customise a text element can be found under the ‘Text’ panel, which can be accessed from the row at the top of the interface. Once it’s open click on the ‘Add Text’ button and Movavi Photo Editor will add a text element to your photo in the form of a frame of broken white lines where you can type out the text you want to add. To customise the text that you’ve added further, you should look in the ‘Text’ panel itself. Right below the ‘Add Text’ button you can adjust the font, and other properties, with more being in the ‘Text’ and ‘Background’ subtabs. 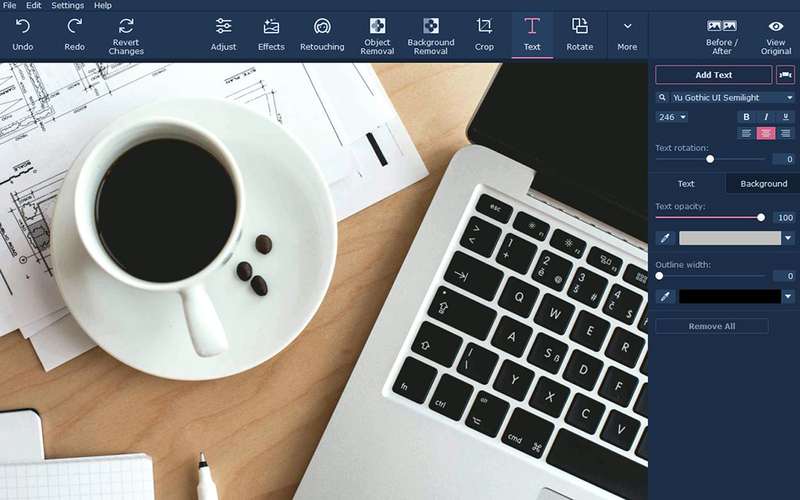 Between the tools there Movavi Photo Editor will let you fully customise the text element, including its colour, justification, size, frame width, and much more besides. Another useful aspect of adding text to photos with Movavi Photo Editor is the ‘Add Decorations’ button that is beside the ‘Add Text’ button. When you click on it you’ll be able to choose from a wide range of creative stickers that you can use to enhance the text elements that you add. Naturally, as a full-fledged photo editor, there are lots of other features of note that you should try, too. In particular you may want to use Movavi Photo Editor to enhance the quality of your photos, remove unwanted elements, replace the background, touch up portraits, apply filters, and so on. All in all however you now know what you need to about adding text to photos using Movavi Photo Editor. Be sure to try it out, as you’ll find it is versatile enough that you will be able to simply add the right text for any occasion.